Do you love sweets and treats but feel that they're in the way of your fitness goals? Meet our Fitness Director in Kingston, Michael, a lover of all things "junk food" who serves as the perfect example that you can enjoy these things and still make the progress that you're looking for! Michael became a trainer in his hometown of Enid, Oklahoma nearly a decade ago and has been involved with fitness both personally and professionally ever since. Michael is currently the Fitness Director in Kingston and has built a career that revolves around helping others make fitness a part of their lives. According to Michael, being able to share his love for the gym and what fitness in all forms can add to someone's life is the best job he's ever had! He has a love for food just as much as fitness and promotes a healthy balance between the two. In his current fitness routine Michael utilizes powerlifting with some traditional bodybuilding which he says allows him to eat the foods he enjoys while still making progress. Be sure to say "Hi!" 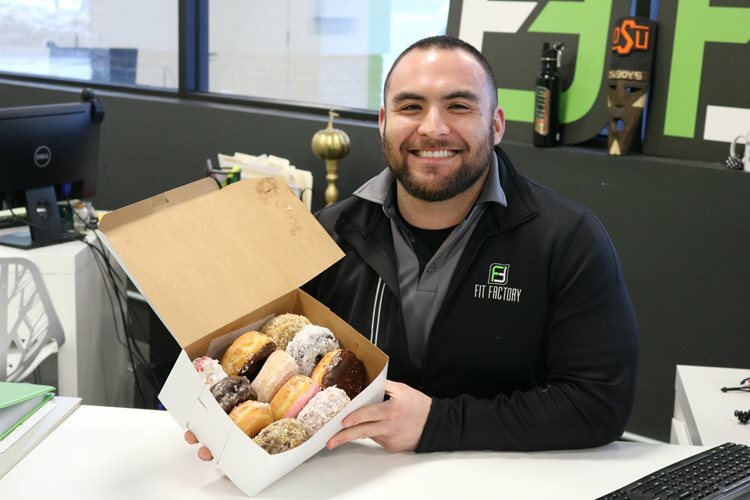 to Michael next time you see him in the club - he'd be happy to book a fitness consultation for you & teach you how you too can eat donuts and still reach your goals! Sign up for your free fitness consultation here!